Thanks to Toni Jones an error has been corrected (noted in blue) on this pattern. R1: Ch21, sc in 2nd ch from hook. Sc in ea rem ch. R2: Ch1, turn. Sc in BL only of ea st.
You can repeat R2 for as many times as you need to custom fit any arm size. Also, you can adjust the number of chains on the foundation chain to get a shorter or longer wrist warmer. Holding R1 & R28 tog, sl st through all corresponding sts. 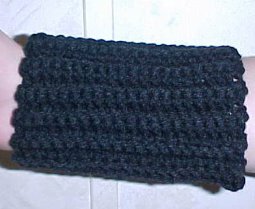 I made the wrist warmer in black for one of my Sunday school students. His school colors are black and red. These are great for the students to show support for their schools.